# 1 — Made With Eight Electrical Generators and 80,000+ volts Most silver supplements are made using electrolysis, through a commercial-quality DC generator. Some small colloidal silver generators can be used at home and run off of 9 volt batteries, though commercial generators produce much higher quality products. Our process is a unique, patented process utilizing 8 concurrent AC generators all pumping roughly 10,000 volts of current through the system (total of 80,000+ volts). That, along with our other proprietary methods, is what gives us an end product that is significantly different in molecule structure and function. 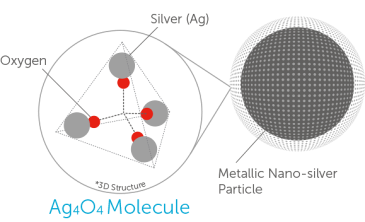 # 2 — Eight Times More Capable Than Other Silvers At Disrupting the Electron Structure of Pathogens The Ag 4 O 4 molecule has the ability to steal eight electrons instead of just one, like regular silver ions or colloids. Each of our Silver Sol particles consists of thousands of these super action oxide molecules which makes them pathogen killing machines. # 3 — Has a Resonant Killing Frequency Studies at some of the top labs in the world have also found that these nano silver particles have other modes of action as well. One of these modes of action includes killing pathogens by emitting a resonant frequency. This frequency has been measured to vibrate at between 200–300 nanometers, which is the same vibrational frequency as ultraviolet light. What this means is that these particles can put out a wave of energy into water or other liquids, that can kill bacteria and other pathogens that the silver particles don’t actually have to touch. American Biotech Labs has filed patents for these frequencies. # 4 — Disrupts Viral DNA A virus is constructed of a “capsid” (protein shell) that contains incomplete segments of DNA and RNA. These DNA segments carry a slight magnetic charge. There is a claw on the outside of the virus that attaches the virus to a healthy cell. Once the virus is attached to a healthy cell it can “inject” the incomplete DNA into the healthy cell, producing damage to the normal DNA and causing it to reproduce abnormally. This can cause viral diseases like influenza, hepatitis, and cervical cancer. Silver Sol particles act like a magnet to attract the charged viral DNA particles. The DNA binds so tightly to the silver that it makes a chaotic tangle of incomplete genetic material that can never lengthen out, so it can never go through replication. This inactivates the virus and prevents replication of viral disease. Normal cells have thicker, more protected cell membranes with a balanced charge, which protects them from the silver’s magnetic attraction. # 5 — Bonds with water The Ag 4 O 4 silver particles are attracted to surrounding water molecules and become semi-bound to the structure of the water molecules. This makes the silver much more bioavailable than any other type of silver particles. # 5 — Bacteria do not become resistant to Silver Sol Bacteria have consistently been proven to develop increasingly powerful resistance to chemical drugs/antibiotics becoming the dangerous MRSA bacteria. Fortunately, there can be no bacterial resistance or adaptation to Ag 4 O 4 . # 6 — The Silver Sol Molecule has an approved US Patent # 7,135,195. This history-making document is accompanied by 43 pages of valid claims both incredible and miraculous. However, they are real and proven in over 200 scientific studies. # 7 — Most Effective Particle Size The statement “smaller is always better” when it comes to silver nano-particles, is generally true, but only to a certain point. The relationship of size to efficacy is explained within the American Biotech Labs’ patent. On page 11 of the new patent, under the heading of “2. Size Analysis” it states, “The smaller the average particle size, the greater the surface area and the greater the contribution of the particular surface chemistry. However, if the particles are excessively small there can be a loss of stability and/or other interactions that negatively affect the product.” American Biotech Labs has received patents on what the company deems the most bio-active or most effective particle size. American Biotech Labs now owns the rights to these particular particle sizes, and no other company or person can legally make a similar product within approximately the next two decades. # 8 — Unaffected by Dehydration Interestingly, it was found that as the Silver Sol liquid dries, the 5-7 nanometer particles would pull together into clusters, and become as if they were a single particle. The extraordinary discovery was that American Biotech Labs silver particles have a very unique charge barrier which allows them to come together quite closely, but does not let them actually touch, holding them within 2-3 nanometers of the other particles in the cluster. As water was added to the clusters, the individual particles “appeared to fly away from the core”, again able to act individually to promote health. Other silver products do not have this unique property. # 9 — 99% Bio-availability Here’s a quote from Dr. Friedman (author of the book, The New Silver Solution) about Silver Sol bioavailability: "When comparing the bio-availabilities of colloidal silver and this new SilverSol, the range for the various colloidal solutions was 15% - 65%, while for The SilverSol was over 99%. This means that an individual would have to take six times as much 15% bio- available silver to absorb the same amount in SilverSol. Yet the concentrations in the SilverSol were lower--and safer. "Kenneth S. Friedman, Ph.D. - 2006 # 10 — Stable For Decades The new Ag 4 O 4 nano Silver Sol molecule is by far the most stable form of silver meaning it is not easily acted upon by outside forces to cause it to lose its efficacy. These silver sol molecules can remain stable for many years (in fact, decades) and can kill bacteria and other pathogens at very low levels of silver concentration. # 11 — Safe Our double blind, FDA-cleared, human ingestion studies were done in three parts as, all available at PubMed as follows: 1. Internal Ingestion Study: https://www.ncbi.nlm.nih.gov/pubmed/?term=2381 1290 2. P450 Drug Interaction Study: https://www.ncbi.nlm.nih.gov/pubmed/?term=2513 7296 3. No Platelet Aggregation Study: https://www.ncbi.nlm.nih.gov/pubmed/?term=2351 7080 # 12 — More Rapid Wound Healing Through Stem Cell Activation Silver Sol stimulates stem cells to migrate to the trauma site and form replacement tissue — enabling wounds to more rapidly heal. Also, the Ag4O4 Silver Sol particle shortens the inflammatory stage of wounds by preventing microorganism destruction of tissue — effectively shortening the inflammatory phase and accelerating the proliferative phase, which speeds healing times and reduces scarring. # 13 — Does not kill or inhibit growth of gut flora and friendly bacteria. Several studies have shown that Silver Sol does not kill friendly bacteria that live in the gut, nor even inhibit their growth. # 14 — Effective Against Swine Flu Influenza Read this report of the effectiveness of Silver Sol Against Swine Flu Influenza Type A/H1N1 Protection from Silver Sol — for Health Care Practitioners and Their Patients By Gordon Pedersen PhD. # 15 — Also Available In Gel Form Silver Gel is a highly advanced product that helps in natural wound healing. It has all the abilities of powerful Silver Sol. Silver Gel has some very specific advantages over regular cosmetic skin care or wound care products: • It creates an almost instantaneous softening and rejuvenation when applied to the skin. • It is non-cytotoxic (will not hurt human or animal cells). • It provides moisture for wound healing and burn treatment and can be used with any bandage already available in any first-aid medical kit. • It helps ease the discomfort associated with burns, wounds, bites or itching problems. • It has no smell, no alcohol and needs no refrigeration. Handy in a first aid or travel kit. • It will remain stable from 17 o to 113 o Fahrenheit. • It was proven non-toxic in oral administration safety studies. Excellent for thrush or as a personal lubricant. • It is designed using only food=grade gelling additives. This means it is safe and non-toxic, even if a child were to accidentally eat a whole tube of it. • It is non-irritating to either the skin, mouth, or eyes. It is great for cracked lips and eye infections. • It is not greasy, contains no alcohol, and if rubbed into the skin, will absorb within 2 minutes, leaving the skin with a wonderful soft, nonsticky feeling. • In hand-scrub tests, it helped to keep the skin clean for up to four hours after application. # 1 — Made With Eight Electrical Generators and 80,000+ volts Most silver supplements are made using electrolysis, through a commercial-quality DC generator. Some small colloidal silver generators can be used at home and run off of 9 volt batteries, though commercial generators produce much higher quality products. Our process is a unique, patented process utilizing 8 concurrent AC generators all pumping roughly 10,000 volts of current through the system (total of 80,000+ volts). That, along with our other proprietary methods, is what gives us an end product that is significantly different in molecule structure and function. # 2 — Eight Times More Capable Than Other Silvers At Disrupting the Electron Structure of Pathogens The Ag 4 O 4 molecule has the ability to steal eight electrons instead of just one, like regular silver ions or colloids. Each of our Silver Sol particles consists of thousands of these super action oxide molecules which makes them pathogen killing machines. # 3 — Has a Resonant Killing Frequency Studies at some of the top labs in the world have also found that these nano silver particles have other modes of action as well. One of these modes of action includes killing pathogens by emitting a resonant frequency. This frequency has been measured to vibrate at between 200–300 nanometers, which is the same vibrational frequency as ultraviolet light. What this means is that these particles can put out a wave of energy into water or other liquids, that can kill bacteria and other pathogens that the silver particles don’t actually have to touch. American Biotech Labs has filed patents for these frequencies. # 4 — Disrupts Viral DNA A virus is constructed of a “capsid” (protein shell) that contains incomplete segments of DNA and RNA. These DNA segments carry a slight magnetic charge. There is a claw on the outside of the virus that attaches the virus to a healthy cell. Once the virus is attached to a healthy cell it can “inject” the incomplete DNA into the healthy cell, producing damage to the normal DNA and causing it to reproduce abnormally. This can cause viral diseases like influenza, hepatitis, and cervical cancer. Silver Sol particles act like a magnet to attract the charged viral DNA particles. The DNA binds so tightly to the silver that it makes a chaotic tangle of incomplete genetic material that can never lengthen out, so it can never go through replication. This inactivates the virus and prevents replication of viral disease. Normal cells have thicker, more protected cell membranes with a balanced charge, which protects them from the silver’s magnetic attraction. # 5 — Bonds with water The Ag 4 O 4 silver particles are attracted to surrounding water molecules and become semi- bound to the structure of the water molecules. This makes the silver much more bioavailable than any other type of silver particles. # 5 — Bacteria do not become resistant to Silver Sol Bacteria have consistently been proven to develop increasingly powerful resistance to chemical drugs/antibiotics becoming the dangerous MRSA bacteria. Fortunately, there can be no bacterial resistance or adaptation to Ag 4 O 4 . # 6 — The Silver Sol Molecule has an approved US Patent # 7,135,195. This history-making document is accompanied by 43 pages of valid claims both incredible and miraculous. However, they are real and proven in over 200 scientific studies. # 7 — Most Effective Particle Size The statement “smaller is always better” when it comes to silver nano-particles, is generally true, but only to a certain point. The relationship of size to efficacy is explained within the American Biotech Labs’ patent. On page 11 of the new patent, under the heading of “2. Size Analysis” it states, “The smaller the average particle size, the greater the surface area and the greater the contribution of the particular surface chemistry. However, if the particles are excessively small there can be a loss of stability and/or other interactions that negatively affect the product.” American Biotech Labs has received patents on what the company deems the most bio-active or most effective particle size. American Biotech Labs now owns the rights to these particular particle sizes, and no other company or person can legally make a similar product within approximately the next two decades. # 8 — Unaffected by Dehydration Interestingly, it was found that as the Silver Sol liquid dries, the 5-7 nanometer particles would pull together into clusters, and become as if they were a single particle. The extraordinary discovery was that American Biotech Labs silver particles have a very unique charge barrier which allows them to come together quite closely, but does not let them actually touch, holding them within 2-3 nanometers of the other particles in the cluster. As water was added to the clusters, the individual particles “appeared to fly away from the core”, again able to act individually to promote health. Other silver products do not have this unique property. # 9 — 99% Bio-availability Here’s a quote from Dr. Friedman (author of the book, The New Silver Solution) about Silver Sol bioavailability: "When comparing the bio-availabilities of colloidal silver and this new SilverSol, the range for the various colloidal solutions was 15% - 65%, while for The SilverSol was over 99%. This means that an individual would have to take six times as much 15% bio-available silver to absorb the same amount in SilverSol. Yet the concentrations in the SilverSol were lower-- and safer. "Kenneth S. Friedman, Ph.D. - 2006 # 10 — Stable For Decades The new Ag 4 O 4 nano Silver Sol molecule is by far the most stable form of silver meaning it is not easily acted upon by outside forces to cause it to lose its efficacy. These silver sol molecules can remain stable for many years (in fact, decades) and can kill bacteria and other pathogens at very low levels of silver concentration. # 11 — Safe Our double blind, FDA-cleared, human ingestion studies were done in three parts as, all available at PubMed as follows: 1. Internal Ingestion Study: https://www.ncbi.nlm.nih.gov/pubmed/?term =23811290 2. P450 Drug Interaction Study: https://www.ncbi.nlm.nih.gov/pubmed/?term =25137296 3. No Platelet Aggregation Study: https://www.ncbi.nlm.nih.gov/pubmed/?term =23517080 # 12 — More Rapid Wound Healing Through Stem Cell Activation Silver Sol stimulates stem cells to migrate to the trauma site and form replacement tissue — enabling wounds to more rapidly heal. Also, the Ag4O4 Silver Sol particle shortens the inflammatory stage of wounds by preventing microorganism destruction of tissue — effectively shortening the inflammatory phase and accelerating the proliferative phase, which speeds healing times and reduces scarring. # 13 — Does not kill or inhibit growth of gut flora and friendly bacteria. Several studies have shown that Silver Sol does not kill friendly bacteria that live in the gut, nor even inhibit their growth. # 14 — Effective Against Swine Flu Influenza Read this report of the effectiveness of Silver Sol Against Swine Flu Influenza Type A/H1N1 Protection from Silver Sol — for Health Care Practitioners and Their Patients By Gordon Pedersen PhD. # 15 — Also Available In Gel Form Silver Gel is a highly advanced product that helps in natural wound healing. It has all the abilities of powerful Silver Sol. Silver Gel has some very specific advantages over regular cosmetic skin care or wound care products: • It creates an almost instantaneous softening and rejuvenation when applied to the skin. • It is non-cytotoxic (will not hurt human or animal cells). • It provides moisture for wound healing and burn treatment and can be used with any bandage already available in any first-aid medical kit. • It helps ease the discomfort associated with burns, wounds, bites or itching problems. • It has no smell, no alcohol and needs no refrigeration. Handy in a first aid or travel kit. • It will remain stable from 17 o to 113 o Fahrenheit. • It was proven non-toxic in oral administration safety studies. Excellent for thrush or as a personal lubricant. • It is designed using only food=grade gelling additives. This means it is safe and non-toxic, even if a child were to accidentally eat a whole tube of it. • It is non-irritating to either the skin, mouth, or eyes. It is great for cracked lips and eye infections. • It is not greasy, contains no alcohol, and if rubbed into the skin, will absorb within 2 minutes, leaving the skin with a wonderful soft, nonsticky feeling. • In hand-scrub tests, it helped to keep the skin clean for up to four hours after application.